The following lines will be dedicated to the product coming from the company named Schwinn. This is a very popular company which makes home exercise equipment. In the past, they were manufacturing road bikes but they took this knowledge and entered the home exercise market with exercise bikes. Schwinn is one of the most advertised company and the product we will be talking about in the text is their most advertised product. Every series of the exercise bikes ever manufactured can be acquired in recumbent and upright models both. The price of this bike ranges from 300 to 1300$. If you would like your bike to have more features and options, you should go for the more expensive one. Several models of exercise bikes are made by this company and we will see which they are. The first model we will mention is mostly used in the physical rehabilitation centers and its design will not leave you breathless. 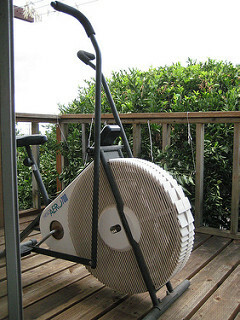 It is called Schwinn Airdyne upright model and it is best for those who would like to get a little exercise without getting injured or making an existing injury worse. Also, it is good for those who are injured. Heart rate monitor and other program features will not be included in this model. The next model is called model 213 and it costs less than 500$. This most popular recumbent model has magnetic resistance option, along with the profiles, heart rate sensors and preset programs. Model 312 will provide the figures of your pulse rate, speed, distance and time. This model is very popular among the customers who state that you will get much more than 500$ you spent on it. Also, it has large seat which will suit everyone. Model 312 is a quality product which will last for a long time and with constant use, which is a reason it can be seen in fitness centers. One of the most expensive pieces of exercise bikes coming from the Schwinn is Evolution Indoor Cycling Bike. If you want to have an indoor exercise machine, you will have to pay more than 1000$ and this specific model costs from 1049 to 1199$. This model looks like a road bike and provides serious workout. This upright model has direct-drive gears and fly wheel of 38 pounds. There is a model named 101, which is a basic model and its price goes from 199 to 299$. It has current resistance system and preset programs, but it will provide the basic exercise. It is best for the beginners. Learn everything you can about the products coming from this company and you will find an exercise bike that suits you. IS TRIMBIA REALLY A SCAM? Is Brytanl a scam product? Upper Body exercises for faster running?